The Stock-Exchange building in Athens is squatted by members of PAME (syndicalists of parliamentary Communistic Party) since today mourning. Mr Chr. Katsiotis, member of PAME’s Executive Secretariat, stated on public TV-station that the movement will last the whole day and it is a part of the Wednesday’s General Strike. The representatives of PAME stated that their aim is to show to the auditors of European Comission, to Central European Bank, IMF who are in Athens where are the money for real and to stop searching in the workers’ pockets. The services of the Stock-Exchange were transfered to a different building and the protestors left the blockade at 14:00. Cops – Tv – Rector Authorities … All the creeps work together. Eventually nobody but nobody wants to abolish the university asylum. Invoking the “defense” of it from alleged small damages in the old buildings of electricians, on Saturday night 20th February, the rector and prosecutor authorities call for strong police forces within the University campus. For them, the unlawful acts that affect academic freedom are two youth’s parties – one in the field of chemical engineering and the other in the building of SEMFE. The commandos of Delta-team, with full support from two teams of special pig forces invade on their motorcycles in the corridors of the school. 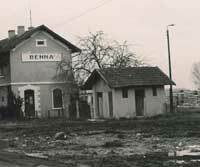 They swear against people, beating them up and bring 30 persons in the local pig station who are left free after a few hours without charge. It’s fifteen years back since the last invasion-evacuation of the technical university in ’95 by the police in the current situation is quite different: The cops now invade even without apparent political events (social struggles and revolting situations). By implementing the new framework law the character of the university asylum changes dramatically. Under this law, the competent authority will become the Rector’s Council (rector and two step-rectors), which means that the requirement to have student consent for the removal of asylum no longer exists. So Mr Moutzouris and each other rector can call the cops at any time … to ‘protect’ the asylum from occupations, events, parties and non-university elements, which are now considered illegal if they obstruct the educational process and the “right to work”. For us, the university asylum is not a sterile area for “pure academic research”, through which, not to forget, knowledge is promoted to the dominant military and economic interests. Neither an institutionalized oasis in the desert of capitalist relations, a no-go area for police. It is a situation through which gets occured continuesly the competition against the power ratio and its corresponding practices. And we support this situation. Therefore university asylum does not get its meaning on the benches of parliament but in the streets and through social struggles. We ourselves give meaning to it. And this situation does not apply only in universities: During December the students gave asylum in Patission street, the squatts do not require legal frameworks, they are socially acquired. Against the general targeting of university sites and ventures, within these we only have to answer with the ongoing sense-university asylum on the basis of social character. Neither institutional or academic: The Asylum regulates what the power is afraid of. Symbolic squat of the European Union’s offices by members of SYRIZA (parliamentary leftish party) against the EU ‘Stability Programm’. There has been an effort by a fascist “citizens group” formed by extreme right wing racists and nazis, with the police in the leading role, to establish a type of Apartheid in the square of Agios Panteleimonas. Now, a new racist experiment is attempted in Plateia Amerikis (Amerikis Square). In this neighbourhood, where locals and immigrants have been living together for years, coexisting in their daily life, in the streets, in schools, in squares and public spaces, racists and the state are trying to artificially create a field of racist brutality and police occupation. In the reality of the financial, social and political crisis, the state and the bosses are launching and attack against the whole of society, intensifying exploitation and oppression. Immigrants and refugees, as the poorest and most excluded part of society, are the ones on whom this attack is focused in the most cruel way: Many are murdered in the borders, imprisoned in concentration camps, tortured in police stations. Living in the country, they are facing the most savage exploitation by the bosses. And they are hostages of the anti-immigration policies of the greek state which divides them into “legal” and “illegal”. A perfect example is the new bill on citizenship that is defining which children have rights and which don’t! This way it is justifying the repression and manhunt of refugees and immigrants without papers while it promotes the incorporation of a small number of immigrants under the condition that they submit. In this context, the state has every interest in spreading racism within the society. 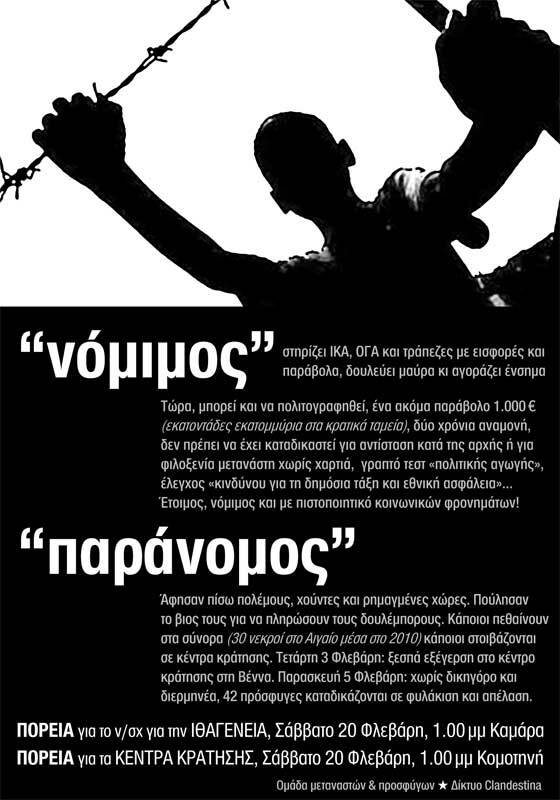 Through a racist campaign by the media, the state is trying to force “national unity to save the greek economy” and it is targeting immigrants as a “threat to security and stability” in order to cultivate fear, class divisions and social cannibalism, so that in conditions of poverty the oppressed will be turned against each other, against the most oppressed among us, and not against the real enemy: the state and the bosses who are looting our lives. This way the state intensifies police repression to force its anti-social policies, especially after the social revolt of December ’08 where locals, refugees and immigrants met in the barricades, giving only an image of the future the bosses will have to face. The state itself is breeding racist groups through its policies and it is supporting them through its official repression forces. This is what happened in Agios Panteleimonas neighbourhood, where the police covered the locking of the playground, arsons against places of prayer for Muslim immigrants, attacks in which immigrants were beaten and stabbed by racists. These racist groups are presented as “local citizens committees” in order for the state to give the image that police brutality against immigrants is supposedly a “popular demand of society”. And it is also using these groups to attack against people and spaces of social struggle that fight in solidarity and against fascism. 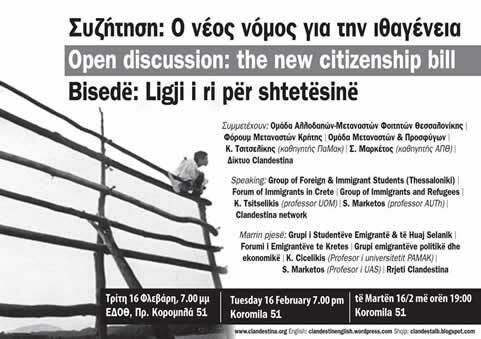 In mid December ’09, a fringe of “citizens”, mainly members of LAOS ultra-right party, showed up in Plateia Amerikis asking that the place will be “cleansed and evacuated”. Their gathering ended ingloriously, and Th. Plevris, a fascist member of LAOS in the parliament, left immediately, when dozens of people went to the square and declared that racists and misanthropists are not welcome in the neighbourhood. This effort of a hate committed to be established was also presented in “Eleftherotypia” newspaper, supposedly progressive. In an article published on 31 December ’09, under a heading saying that Plateia Amerikis is “a bomb about to explode”, a fake image of the neighbourhood is presented and the real motives of the racists are obscured by a discourse about cleanness and degradation problems of the area. Ultra-right conservatives and neo-nazis, with the blessings of the police, think that they can turn this multicultural neighbourhood of Athens, where locals and immigrants have a tradition of living together, into a field of intolerance and racist hatred. They think that they will be allowed to assault refugees and spaces of self- organization and social struggle (social centres, housing squats, parks). Never! Like in every neighbourhood, locals and immigrants, we are people who live together everyday, in our workplaces, in schools, in the squares. We share common problems (unemployment, work exploitation, devastating way of life in an urban jail, without sufficient green and free spaces, control and repression). And we will fight together for a world of equality, having solidarity as our weapon and having as only enemy the enemies of freedom for all people. – No racist and no fascist will define which people are allowed to live together in the neighbourhoods, to hang out in the squares and to walk in the streets of the city. – No consent to the racist policies of the state against immigrants. – No tolerance to the fascist – racist gangs. Today, 23rd February, we squatted the Polytechnic University to highlight the prolonged repression methods which are taking place during the last year. From the cop-occupied neighborhoods, arrests of social fighters with fake blames, the attacks against self-managed spaces and comrades’ homes until the braking of University Asylum and murders caused by state. A reason for our action was the vulgar invasion of cops in the University campus at Zografou district on Saturday night, after the breaking of Asylum with the rector’s order, in an effort to turn public opinion against Asylum. In the face of the repressive moves, we respond by holding occupied until at least tomorrow evening the Polytechnic. This way, the Asylum is used effectively and makes stronger the tomorrow’s mass protests against the imposition of the social model that wants us to work and consume in full submission. We call for a meeting of the squat today at 10 pm in the Gini building. P.S. The chairman of the school of architects gets ridiculous after his hasty and spasmodic lock-out movements and statements concerning the theft of photocopiers. We took the photocopiers after we talked with the guards and we want to use them for printing leaflets. Demonstrations in Naousa and Veroia towns. In Veroia on the top of the demonstration anarchists/antiauthoritarians instead of the parliamentary communists. Comrades with flyers, slogans, flags, plakats started demonstrating after the gathering in the town’s Working Centre. Spontaniously people who were on the spot joined them. Anarchists’ presence also in “the dinasaurs’ nest” (frozen parliamentary syndicalists) at Naousa town. Demonstration in Volos town. The bosses of METKA factory (watch older update) tried to stop workers to participate in the strike by announcing that the building was needing 32 persons inside for fire safety. Striker Workers gathered early in the mourning around the building, blocked the entrances and allowed this way the workers to participate in the strike. 500 people decided to participate in the independent demonstration and 120 joint the official syndicalists’ gathering. Participation also from Matsaggou Squat, libertarian communists, out-parliamentary organisations. The demonstration in Thessaloniki city went smoothly with the participation of many people. At the tale of the demonstration the anarchists’ block with a plakat that was written on it “War Against the Bosses’ War”. Also a block of Libertarian Syndicalistic Union with a plakat writting “Capitalism is not in Crisis, Capitalism is the Crisis Itself”. In the last block a lot of people participated together with Antiauthoritarian Movement. A lot of flyers and press stuff were spreaded and slogans were sprayed on shops’ walls that did not participate in the General Strike. People threw garbage in Hondos Centre (multinational perfume company) so the company had to join the strike after this action. A street camera was smashed, a European Union’s flag was burnt and slogans were sprayed on government buildings. After the end of the demonstration, students in Aristoteleio University started smashing control bars at the entrences of the Campus. Pigs entered the campus and started chasing the people. More people joined the events after the pigs’ attack, smashed more bars and chased the pigs away. The rectorship building is squatted and an assembly will take place during the evening. Demonstration in Chania town on Creta island. Around 450 people participated in the out-parliamentary and independent organisations demonstration. We do not have a number of the parliamentary communists’ demonstration. Demonstration also in Irakleio town of Creta island. Around 2000 people participated after the call of parliamentary left parties, out-parliamentary communists, independent organisations, anarchists etc. Demonstration in Patras city. Around 1300 people joined the demonstration of out-parliamentary communistic organisations; anarchists have not make a call for today. A higher number of protestors in the parliamentary communists’ gathering. Despite the state’s repression methods in the demonstration at Athens participated around 100.000 people. One bank entrence was built with bricks from a builders’ team. The pigs started attacking the independant blocks and try to ceperate them from the main body of the demonstration. The people responded imediatelly and attacked back by smashing the cops’ shields, chasing them away and defend against any new special pig team that was arriving. In the clashes also 45 years old people against the pigs. One undercover pig had also to visit a doctor after people found out he was a cop. Also the masses of people chased away the pigs by shouting against and forbid them to come close to the demonstration. Many multinational companies were smashed down. The pigs attacked with tear-gas and sound-shine granades at Syntagma Square in front of the Parliament and people responded with some mollies, stones and wooden sticks. On Stadiou Street a special pig forces team tried also to attack. The responce from anarchists, syndicalists, indepentents, workers, people of any age was again one and the same: stones, bottles and whatever could be found on the streets flew on the heads of the cops. RAGE and RAGE can be two words to describe the situation! Attack also at ‘Zonars’ Burgeois Cafe (9 euro per coffee) when the people spontaniously entered the cafe, stole everything from inside and smashed down the front-glasses. People also entered in Papasotiriou Bookshop, took many books in zero price and gave it to demonstrators. Also clothes from a multinational company were taken away in zero price and given to people. All the actions above happened spontaniously. Also, the anarchist/antiauthoritarian/libertarian communistic block was the biggest than the rest of the others. Participation also from many refugees. Many 50 year old people joined also the radical blocks and were amused by the smashing down of banks and multinational companies. We do not know yet any number of arrests. Fotos from Radikal, tr: http://www.radikal.com.tr/Radikal.aspx?aType=RadikalGaleriHaber&Date=24…. RACISTS AND FASCISTS ARE NOT GOING TO DETERMINE WHAT PEOPLE WILL LIVE TOPGETHER IN OUR NEIGHBORHOODS, WHAT PEOPLE WILL SPEND TIME TOGETHER AT SQUARES, WHAT PEOPLE WILL WALK ON THE STREETS. 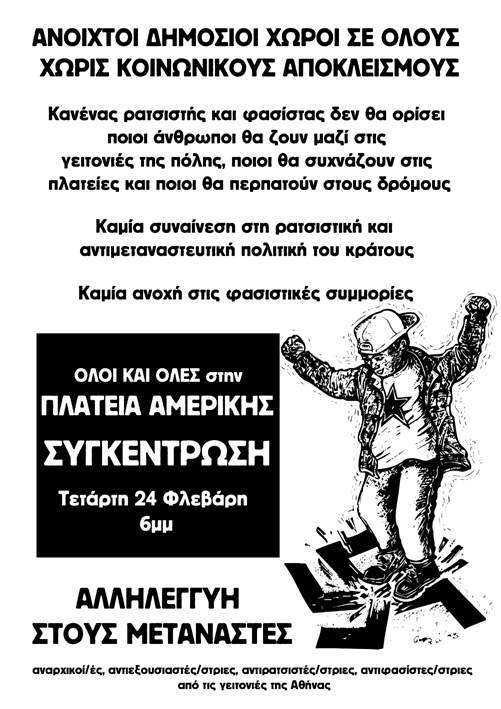 Anarchists, Antiauthoritarians, antiracists, antifascists from Athens’ neighborhoods.